The 175 retail units, which provide 1.4 million sq ft of space, house three department stores. Leisure areas include a cinema, two hotels, restaurants, cafés and bars. Also contained within the development are apartments, offices, a park, a new public transport interchange, and underground and multi-storey car parking spaces. 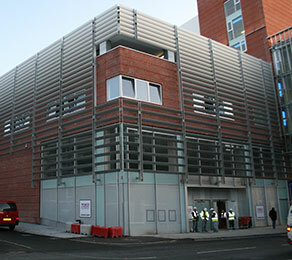 Tesco’s recently completed new building on Hanover Street required the creation of voids in the post-tensioned concrete slabs. These were necessary to accommodate two hoists and a travelator. CCL was engaged to non-destructively locate the post- tensioning tendons around the cut lines of the voids and to subsequently create small penetrations in the concrete slab. The post-tensioning duct could then be removed and the grout introduced. Prior to implementation, CCL instructed the material supplier to carry out controlled tests in its laboratory, after which a grout anchor was then mocked up to ensure complete satisfaction with the proposed solution. CCL was appointed by the main contractor Kier as the specialist concrete repair subcontractor because of its proven ability to coordinate and execute a bespoke solution to this problem.